These Fried Plantains remind me of living in Puerto Rico. I lived there for about three years and anytime we’d go to a local food spot, fried plantains were always on the menu. 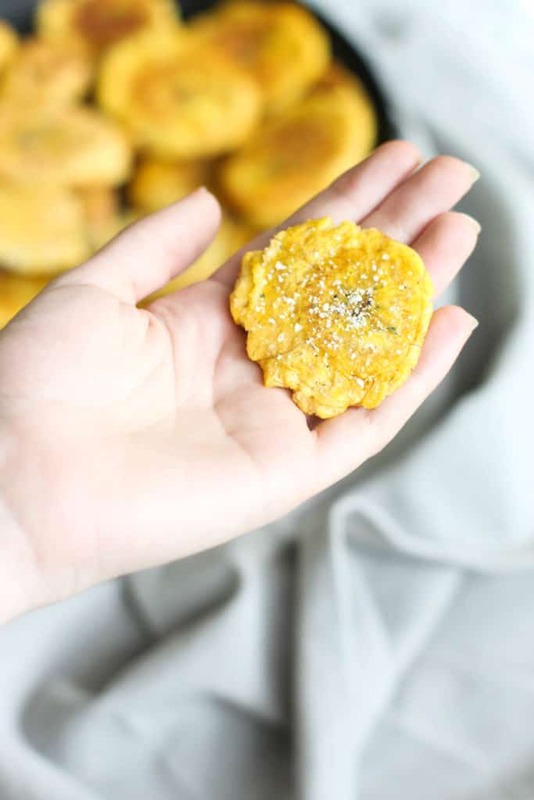 We had a plantain tree in the back of our house that I remember being able to go up and get one and I’d wait patiently for my mom to fry them up. She’s Puerto Rican so I love being able to try foods that she grew up on.These Fried Plantains remind me of living in Puerto Rico. I lived there for about three years and anytime we’d go to a local food spot, fried plantains were always on the menu. We had a plantain tree in the back of our house that I remember being able to go up and get one and I’d wait patiently for my mom to fry them up. She’s Puerto Rican so I love being able to try foods that she grew up on.These Fried Plantains remind me of living in Puerto Rico. I lived there for about three years and anytime we’d go to a local food spot, fried plantains were always on the menu. These Fried Plantains remind me of living in Puerto Rico. I lived there for about three years and anytime we’d go to a local food spot, fried plantains were always on the menu. These Fried Plantains remind me of living in Puerto Rico. I lived there for about three years and anytime we’d go to a local food spot, fried plantains were always on the menu. These Fried Plantains remind me of living in Puerto Rico. I lived there for about three years and anytime we’d go to a local food spot, fried plantains were always on the menu. These Fried Plantains remind me of living in Puerto Rico. I lived there for about three years and anytime we’d go to a local food spot, fried plantains were always on the menu. These Fried Plantains remind me of living in Puerto Rico. I lived there for about three years and anytime we’d go to a local food spot, fried plantains were always on the menu. These Fried Plantains remind me of living in Puerto Rico. I lived there for about three years and anytime we’d go to a local food spot, fried plantains were always on the menu. These Fried Plantains remind me of living in Puerto Rico. I lived there for about three years and anytime we’d go to a local food spot, fried plantains were always on the menu. These Fried Plantains remind me of living in Puerto Rico. I lived there for about three years and anytime we’d go to a local food spot, fried plantains were always on the menu. These Fried Plantains remind me of living in Puerto Rico. I lived there for about three years and anytime we’d go to a local food spot, fried plantains were always on the menu. 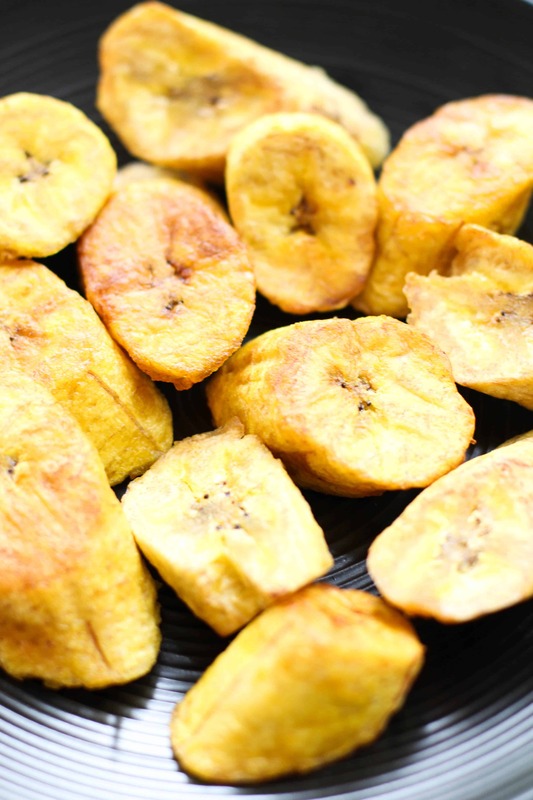 We had a plantain tree in the back of our house that I remember being able to go up and get one and I’d wait patiently for my mom to fry them up. She’s Puerto Rican so I love being able to try foods that she grew up on. 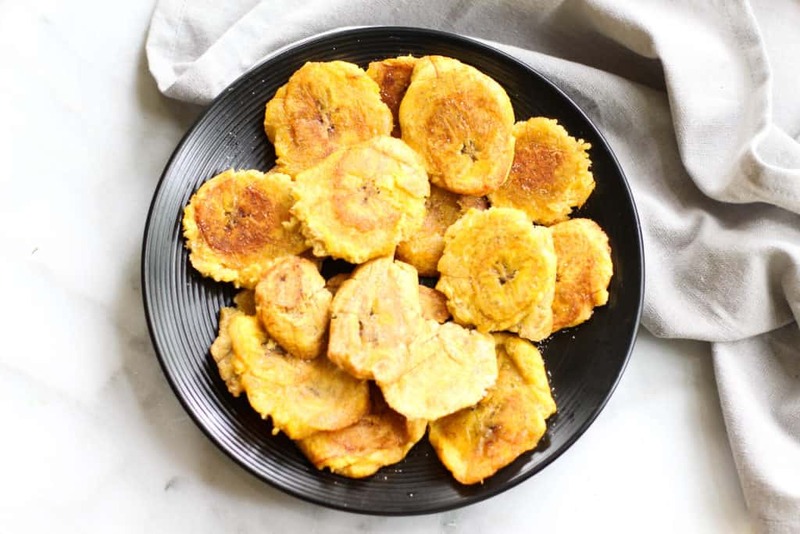 You’ll also have to try the difference between green plantains and over-ripe plantains. The green plantains turn out much more savory. So obviously as a kid the over-ripe plantains that turn out sweet were my favorite. Since the green plantains are still very hard and starchy,I soak them in water for about 15 minutes just for the water to soften them a little. Be sure to dry them off really well since they’re going in frying oil. This will help the middle cook more quickly rather than burning the outside in order to cook the middle. The typical way to eat them is with a little bit of sea salt sprinkled on right after you fry them so it sticks and melts to them. I personally love using garlic salt just for that extra kick of flavor. There’s also a few ways to fry them. The sweet plantains usually aren’t flattened, while the green ones are. My mom always flattened the green ones once, but some people like to flatten them then throw them back in the fryer. You can use the flat side of the meat cleaver or just the bottom of a can with some parchment paper like my grandma used to do! Be sure to salt them once you get them on a paper towel lined plate and eat while they’re hot! 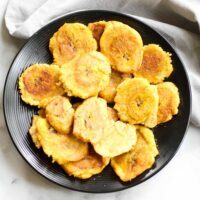 These Fried Plantains are really easy to make and have you dreaming of a summer in the Caribbean! 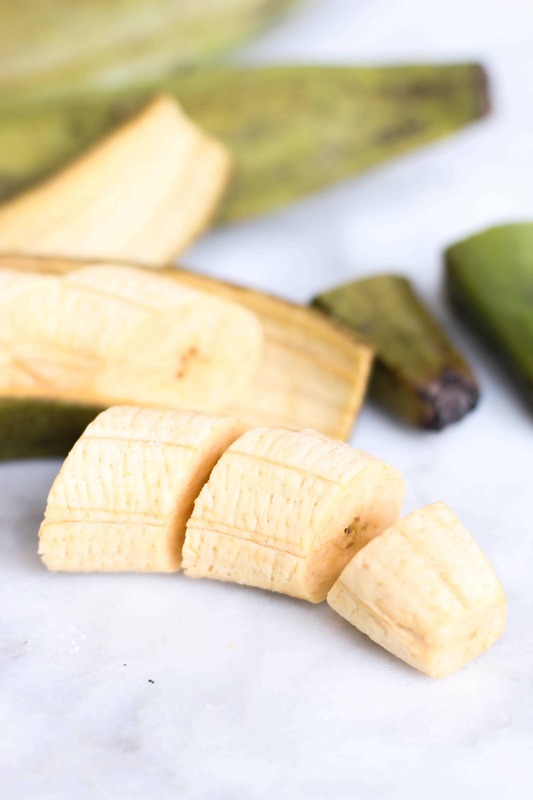 Cut either side off of the plantain and cut down the middle to remove it from the peel. Cut on a diagonal about 1 inch pieces. If using green plantains, let soak in water for 15 minutes. Remove and pat down well on paper towels. Heat up veggie oil in a 12” skillet over medium heat. It should reach about half way up the plantain. It’ll take about 10-15 minutes to heat up. You’ll know it’s ready when you put the plantain in and it starts to bubble around the bottom. Place your first batch in, ensuring not to crowd the pan. Cook 4-5 minutes on both sides making sure the plantains are golden brown. Remove and place on a paper towel lined plate. Flatten using flat side of meat cleaver or the bottom of a can with parchment paper. 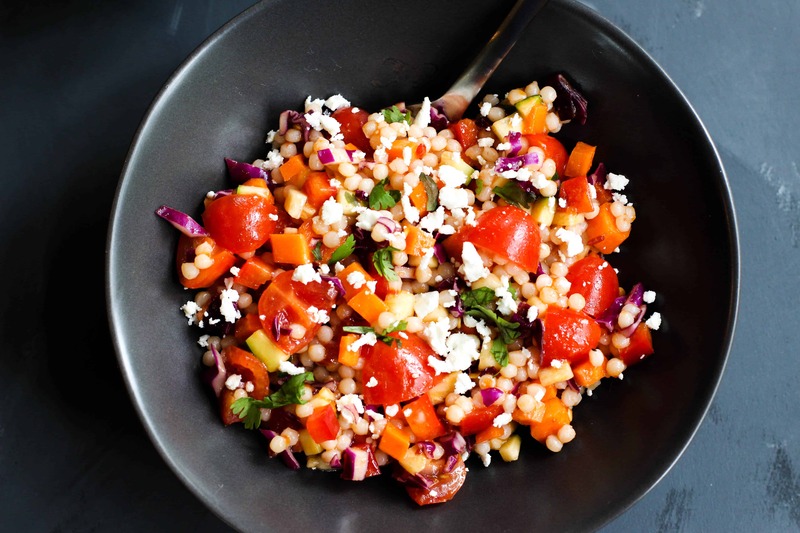 Sprinkle with salt or garlic salt and enjoy warm!